Winter has set in and I've taken all my warmer jackets out of storage! Winter is actually my favourite season, I love cozy nights in, drinks around a fire and toasty hot chocolate! And, when heading out- I love to layer up! 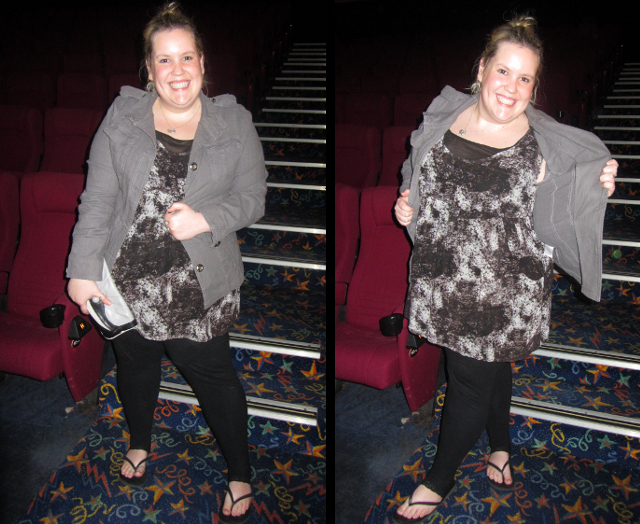 We went out for dinner and to the movies last week to see Avengers (totally awesome by the way, you have to see it!) and I wore this comfy tunic top and jacket. I think the military inspired tailoring on the jacket really structures the outfit. This one is so easy to throw over an outfit, it's become a chilly season staple. We always stay till the very end of the movie in case there is anything after the credits, so as usual we were the last ones in the cinema. I thought it was the perfect chance to take a few OOTD piccys- even if we did get some funny looks from the cleaners! Also, how feral do the seats look?! Can't see that when the lights are down! What kind of jacket do you wear on chilly nights???? Oh, as for your question - I have my New Look Mac coats (i have a post coming up about them i think tomorrowish) they're so lovely and long and really warm for being from New Look!!! Also I found the City Chic fur collar jacket was really warm even if it isn't natural fibres. The faux fur keeps my neck warm too!! It's such interesting thing, I am ready for summer and you are happy for winter :). Love the jacket you have on. It's hard to think of winter, but I love grey as a colour & your top is gorgeous! hey sweetie! That grey jacket is absolutely adorable! Love the tunic!! 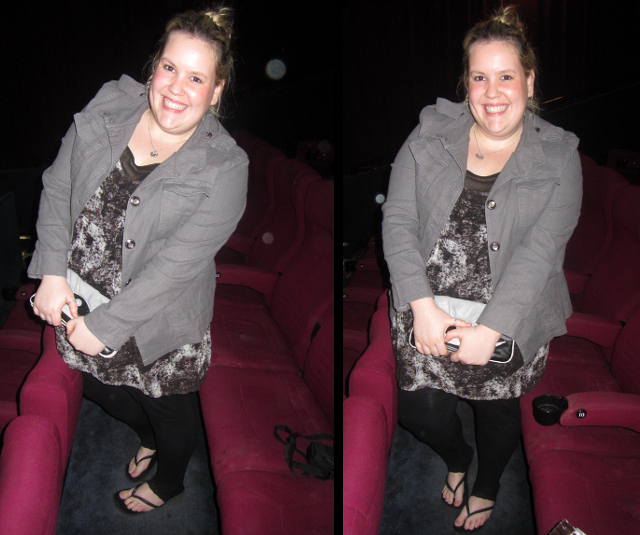 And I think the empty cinema seats make a good background/ feature! I love being the last people in the theater, my boyfriend and I always wait till everyone leaves as well. The Avengers was a pretty good movie, my boyfriend was bummed we didn't catch it in D-Box. You look adorable as always, this is a really cute jacket, I love the color. I love the jacket/dress combo. The mix of textures really works!